Unwelcome as it may be to Deutsche Post DHL, it is the performance of its Post-eCommerce-Parcel (PeP) division that will grab the attention in its recently published third quarter results. On the surface PeP’s results were not that problematic, with year-on-year revenue growth in the third quarter up 0.6% at €4.3bn. The internet retail business saw good underlying demand, with revenue up 6.7% at the German Parcel business and up 6.3% at eCommerce. However, Mail took a significant hit with revenue down 4.4%, generally reflecting the continued decline in underlying demand for traditional postal services. The real problem came in the profitability of the PeP business. Overall PeP saw operating profit turn negative in the third quarter at a loss of €209m, compared to a profit of €307m in the same period last year. DP DHL described the situation in the third quarter as a “one-time expense…designed to safeguard the EBIT growth forecast”. For the nine months EBIT was €290m, down 70% on the same period the year before. Yet for this period the company describes the reason for the fall as due to “higher costs for material and labour” as well as higher early retirement costs. Looking at what is a complex situation, PeP is having to invest heavily in both capital equipment and redundancy/early retirement costs to reclaim the level of operational profitability it aspires to. The picture for the rest of DP DHL is much brighter. The once troubled Global Forwarding and Freight business saw profits jump back up, with a 58.2% increase in the third quarter and a 61.5% increase over the past nine months to €281m. This performance has been delivered by improving the quality of business that Global Forwarding does, resulting in a fall in volumes handled but a return on sales that increased for the nine months from 1.6% last year to 2.6% this year. DHL Supply Chain saw profits edge up 3.4% over the third quarter, however over the nine months they are down 9.4% at €336m. Over the most recent quarter margins have been improving however, to 4.7%. 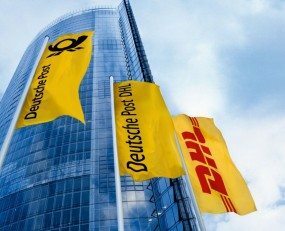 Overall Deutsche Post DHL in the third quarter saw revenue 1.4% higher at €14,849m and ‘consolidated’ net profit fall by 77.4% to €146m. Such profit falls are not good. The rest of the business is doing satisfactorily and Global Forwarding and Freight appears to have been fixed, but the problems at PeP are real and it is not certain how long they will go on for.